Sterling Pro Charge B Waterproof 12V-24V Battery-battery 30A digital charger BBW1224. The Pro Charge B is a fully apoxy encapsulated, plug and play battery to battery charger. It is primarily designed to be put between the starter battery and an appliance battery (trolling/bow thruster/domestic). The charger puts a load on the alternator and converts that load into a 4-stage charging profile to provide fast and effective charging to the leisure/domestic batteries. The whole point of the charger is to charge your batteries up when you drive/cruise along by fully utilizing your on board alternator. The charger is best suited for alfreso use to fully utilize its weatherproof casing. Therefore, it tends to be at home on bass fishing boats charging the trolling motor bank it can be used in plethora of other places. Sterling Power Battery to Battery Charger waterproof and saltwater tested to IP68. Charges your battery system 5 times faster! Easy low cost installation, simply connect to your starter batteries and your domestic batteries. Automatic battery bank size and state sensing. Battery temperature sensing and compensation. Overload and short circuit protected. Includes 2 metres pre wired cables with fuses waterproof. No remote control option Instruction Manual. Dimensions: 230 x 135 x65. For all your commercial and leisure vehicle needs.. The item "Sterling Pro Charge B 12V-24V Battery to Battery 30A digital charger BBW1224" is in sale since Thursday, September 22, 2016. This item is in the category "Vehicle Parts & Accessories\Motorhome Parts & Accessories\Campervan & Motorhome Parts". 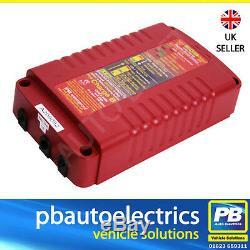 The seller is "pbautoelectrics" and is located in mansfield, Nottinghamshire. This item can be shipped to United Kingdom.